Porter Drive is lined with the sort of independent, locally owned commerce usually found on the grubby outskirts of most American cities: Body shops, upholstery shops, welders, tool rentals, used cars lots, towing services, mechanics and the best Mexican food restaurants in the region. You’ll also find a prominent tobacco and smoke shop, with a selection of vape products, pipes and hookahs. And there’s a beauty salon next to the upholstery shop. All this is along two blocks on the south side of The Bridge, the commercial heart of downtown Pajaro, population 3,070. By contrast, the north side of The Bridge, across the Pajaro River, is a tree-lined example of a classic American Main Street. There’s a Burger King and a McDonald’s about a block from The Bridge. Main Street Watsonville glistens with the shine of recent redevelopment. The Bridge is the stitch that binds Pajaro to modern convenience. The Bridge is also what binds Pajaro, an unincorporated community that is technically located in Monterey County, to Watsonville, the second-largest city in Santa Cruz County. It’s a bit of an awkward situation. The residents of Pajaro have a natural affinity to an adjoining city in a county just across the river, while they are dependent on Monterey County for basic services. Still, Pajaro has a strong sense of its own identity. Nearly 95 percent of its population identifies as Hispanic or Latino, according to the U.S. Census Bureau. The median age of the community’s residents is almost 24 years, one of the youngest communities on the Central Coast. They are working class, mostly employed in the fields or packing sheds, and a third of them live below the poverty line. The community’s primary institutions are a middle school (elementary-aged students are bused outside the community) and a very active Roman Catholic church. A team from Voices of Monterey Bay visited Pajaro on September 10, 2017. We started at Our Lady of the Assumption Church, we talked to Pajaroans about their community, and we followed up with reporting after our visit. Salvador López has lived in Pajaro off and on since 1965. He showed up as a teenager, ready to work the fields. It made sense at the time — Pajaro was a farm worker town and there were lots of strawberries to pick, even back then. He left for factory work in Wisconsin, but that only lasted a couple of years and he returned to the strawberries. “It was hard work, for young people,” López said. His back eventually gave out and he had to figure out what to do to earn a living. He said the community in Pajaro gave him practical strength, but his faith in God sustained him. He became active at Our Lady of the Assumption Church, which serves as the center for much of the social, spiritual and human services activity in the community. On Sundays, he is at the altar in his vestments, assisting Rev. Victor Manuel Prado through many of the five Spanish masses scheduled each week. Lopez was ordained a deacon five years ago. Deacon López is a big bear of a man, demonstrably friendly, with an air of Sancho Panza as portrayed by James Coco. Any conversation with López at the church is certain to be interrupted often by parishioners who want to say hola. Services at Our Lady of the Assumption are always packed, but the 9 a.m. mass is always standing room only in a nave that seats about 600. By contrast, the only English-language mass, at 11 a.m., draws about 400. On any given Sunday, a total of about 2,000 people attend one of the five services. That’s in a community with a population of only 3,070. Some parishioners come from nearby communities, including Las Lomas, Moss Landing and Watsonville. “Probably 90 percent of the people here work in the fields,” López said, sitting briefly to chat after the 9 a.m. mass. “They come from different states, from all over Mexico.” He said the church ministers to about 60 Mixtecos, indigenous Mexicans who are particularly challenged because of language barriers. But there are concerns and a lot of anxiety within the parish these days, he said. 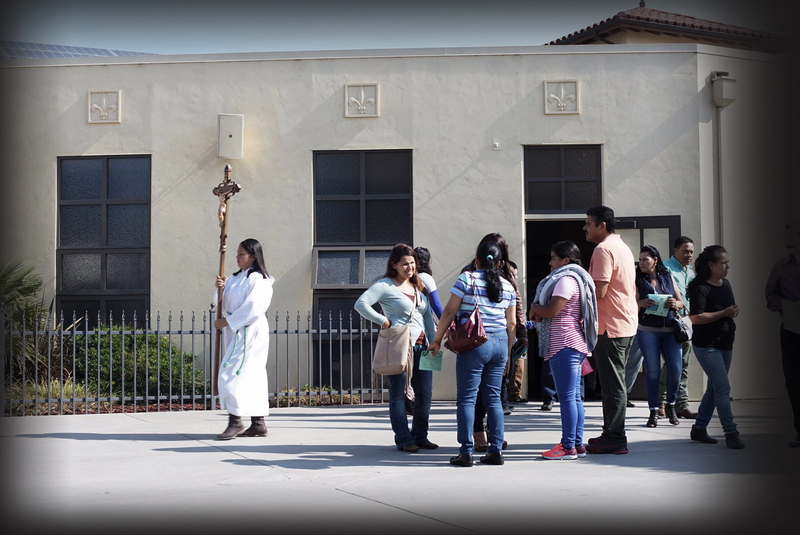 Parishioners are stressed about aggressive immigration enforcement measures. They are anxious about President Trump’s recent announcement that he would end Deferred Action for Childhood Arrivals, or DACA. What can a Catholic deacon do or say to counsel them? “I tell them I understand,” López said. “I came to the U.S. myself 50 years ago (from Michoacán). At the conclusion of the 9 a.m. mass, worshippers stream out a side door. Dozens of them stop at a makeshift grill staffed by Paula Calles and Isabel and Lorenza Alfaro, who are busy slapping together thick, heavy pupusas. The pupusas sell for $2 each, and proceeds will help fund a roof replacement project at the church. The renovation of the church was completed in 2010, but the roof still needs repair. The new roof will cost about $2.4 million, and the church has only raised about a quarter of that. Calles left El Salvador with her five children and her pupusa recipe 18 years ago. The family escaped the war, and Calles said it’s the best thing she’s ever done. Her two youngest kids finished high school. “I’m fascinated by my grandchildren,” she said in Spanish. The three women slap the sumptuous round pupusa discs before throwing them on the flat grill. The treats, which start with a masa harina base, come in one of two fillings: a “revuelta” with pork and beans, or with beans and cheese. In casual conversation, they say they learned to make pupusas when they were little girls in El Salvador, just as rural Mexican girls learn to make tortillas. The Alfaro sisters say their immigrant story is similar to Calles’. Lorenza came to the United States in 1984, and her sister Isabel followed a few years later. Lorenza arrived in Santa Cruz with only a piece of paper bearing the name of a friend’s grown son written on it. She found the man, who let her stay at his home for three months. She immediately started working whatever jobs she could find: babysitting, cleaning houses, harvesting strawberries. Lorenza moved to the Watsonville area four years ago to escape the high Santa Cruz rents. But even in rural Monterey County, they seem unavoidable. Another parishioner, Juan Gómez, 19, stands in the shade outside the church. Coming from Oaxaca, he showed up in the United States two years ago and immediately found work in the strawberry fields. He spends most Sundays at Our Lady of the Assumption attending at least three of the masses. He sold Bibles and other books on the sidewalk outside the church for a while, but was asked to stop several weeks ago. He said he prefers Pajaro to his native country. “Yes, there is work (in Oaxaca), but the corn harvest is only during the rainy season,” he said. “After you pick everything, you have to wait six months.” He wears gray trousers and a neatly pressed black shirt, his Sunday best, and he has an easy smile. He said he shares a three-bedroom apartment with seven other people, including his sister and her husband. Their monthly rent is $1,300. Back at the pupusa grill, Lorenza Alfaro talked about a general lack of respect that seems to permeate society. The new park along the levee is proof that the town of Pajaro can have nice things. It’s got a couple of covered picnic areas. The soccer field is used all day long on Saturdays and Sundays. And there’s a smaller baseball field — more like a softball park — that shares right field and most of center field with the soccer field. The fence along the eastern boundary is radiant in cheerful-colored murals created several years ago by a team from CSU Monterey Bay, Hijos Del Sol and the Arts Council for Monterey County, from images developed by students at nearby Ohlone Elementary School and Pajaro Middle School. The park has been a hit in Pajaro since it opened almost four years ago. It’s the town’s first real park that’s not one of those bitty “pocket parks” for little kids. Which means people don’t need to cross the bridge to celebrate birthdays or family reunions in Watsonville. Or haul their kids there for Sunday soccer matches. When the park opened, a county official declared that it felt like “walking into Disneyland.” Which was, obviously, an exaggeration. It’s a nice little park, sure, but it is sadly lacking in animatronic pirates. Ask anybody, and they’ll say they’re happy the city built Pajaro Park… but then it gets a bit convoluted. Because, technically, Pajaro is not a city, not in the formal sense. And practically everyone who lives in Pajaro feels an affiliation to Watsonville, which is a formal incorporated city. Watsonville, across the Pajaro River Bridge, is in Santa Cruz County. Pajaro is in Monterey County. Monterey County government should be providing public service to Pajaro, and they do to some degree. Streets and sidewalks are maintained by the county, and a Monterey County library branch is situated behind Our Lady of the Assumption Church. So while folks who pay attention to local government likely assume that Monterey County built and maintains Pajaro Park, many residents of Pajaro assume the city of Watsonville built it. But as it turns out, the park was built with redevelopment grant funds on property donated by Granite Construction and, after a convolution of deals, is now owned and operated by something called the Pajaro/Sunny Mesa Community Services District. “It gets kind of confusing,” said Fred Martínez, a 30-year resident of Pajaro who spends several hours on Sundays at the park watching his grandson tend goal for a youth soccer team. The Pajaro/Sunny Mesa district is one of those catch-all quasi-government agencies that sometimes pop up to provide basic services to densely-populated rural communities. To put it simply, the community services district serves as a fill-in city hall for a community that is not technically a city. Monterey County has seven such districts, from Pajaro to Castroville to Pebble Beach. Each of those districts collects property assessments that are spent on specific community needs, like streetlights, sidewalks, water and parks. Pajaro/Sunny Mesa was first created in 1986 to administer water and sewage services to Pajaro and Sunny Mesa, a nearby subdivision just west of Hall Road and Las Lomas. Until then, Pajaro was getting its water from the city of Watsonville via a redwood pipeline created more than 100 years earlier. Residents in Pajaro realized they had a serious problem when a house on Railroad Avenue burned to the ground because the rural fire department couldn’t get water out of the collapsed aging pipeline. Monterey County created something called the Pajaro Services District to establish a new water system, and the Pajaro district eventually consolidated with the Sunny Mesa district. The new agency took on more responsibilities, including the maintenance of tiny pocket parks in Pajaro. The confusion over who built what and who pays for it doesn’t really matter to most of the people of Pajaro. The main thing, according to Martínez, is that people take a lot of pride in the park. The place fills with children’s laughter and with the encouragement of team moms who cheer their little soccer players. The park is pristine, and the outbuildings and murals have never been tagged. “What I like is the respect people have for the place,” Martínez said. The Pajaro/Sunny Mesa Community Services District has the curious distinction of operating with only one Latino on its board of directors, even as it represents a community where 95 percent of its inhabitants are Latinos. It’s also unique in a couple of other — and startling — ways. For instance, Pajaro/Sunny Mesa is the only general-purpose community services district in California that does not allow voters in the district to elect its board. Instead, the Monterey County Board of Supervisors appoints the five-member community services board, which sets policies and determines how money gets spent. Back when the Pajaro Community Services District was created, residents of Pajaro did elect its governing board. Somehow, all that changed when the district consolidated with Sunny Mesa. And it remains an appointed board — even after a state law was enacted in 2006 that required all community services district in the state to hold board elections. In 2008, the Pajaro/Sunny Mesa board asked the California Senate Local Government Committee to add an amendment to its omnibus bill to convert its appointed board of directors into a board elected by voters in the district. It was a routine request. Omnibus legislation generally contains dozens of minor, noncontroversial statutory changes to minor, noncontroversial laws. The Pajaro/Sunny Mesa proposal had been added to drafts of Senate Bill 113, the omnibus bill in 2009. However, the language specific to Pajaro/Sunny Mesa was removed from the legislation before it was ratified by a Senate vote. Not long after that, three of the five members of the Pajaro/Sunny Mesa board were removed from the board and replaced with appointees selected by the Monterey County Board of Supervisors. “The county objected (to an elected board) and it was dropped,” Rosa said. 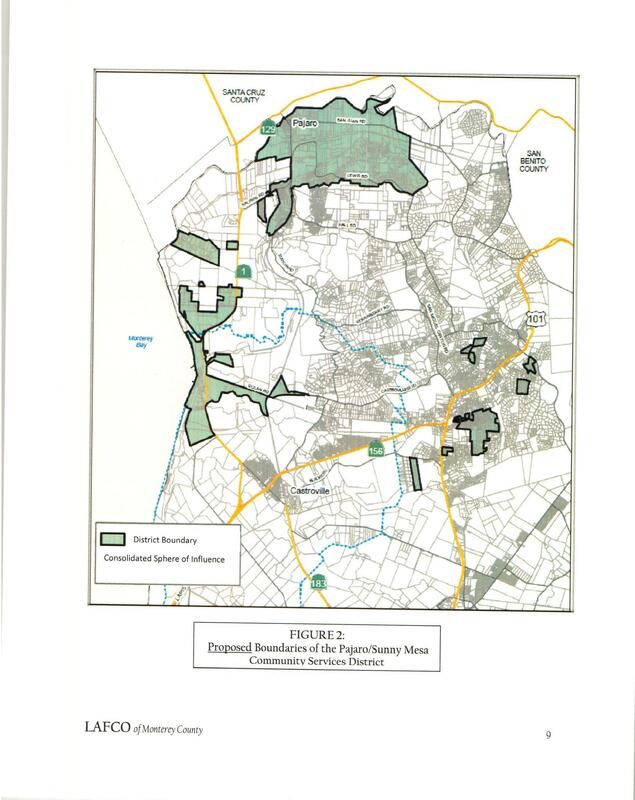 In addition to Pajaro and Sunny Mesa, the district’s boundaries includes ten non-contiguous service areas in bubbles throughout North Monterey County, including Moss Landing and pockets of Prunedale. In that way, Pajaro/Sunny Mesa is also unique in the state of California, where every other community services district serves one very specific community. “Elections are complicated when you have 10 different non-contiguous water systems you’re trying to represent,” Rosa said. He said the “conversation” does come up occasionally, but the cost of holding elections usually dampens enthusiasm. The district did a study once, Rosa said, and learned that it would cost up to $100,000 to hold elections. So the Pajaro/Sunny Mesa board is appointed by the Board of Supervisors. At present, only one of the district’s five board members is from Pajaro and another is a Latino. Rosa said the four-year terms of three of the current board members expire next year. His office will be sending notices to each of the 1,500 customers in the entire community services district. The notices will invite customers to apply for a seat on the appointed board. “We’d like to have more diversity,” Rosa said. President Theodore Roosevelt made a ten-minute whistle stop and delivered a quick, generic speech at the Pajaro Rail Station on May 11, 1903. Have something to say about this story? Check out Your Voices.